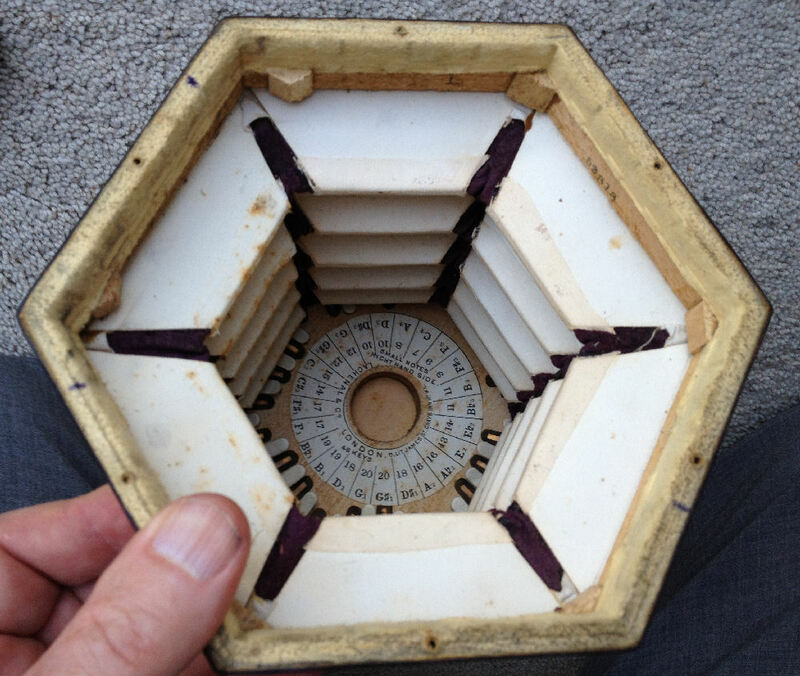 It is hexagonal with 48 rather worn bone keys. As it is a basic tutor model, it had the C keys marked in red. 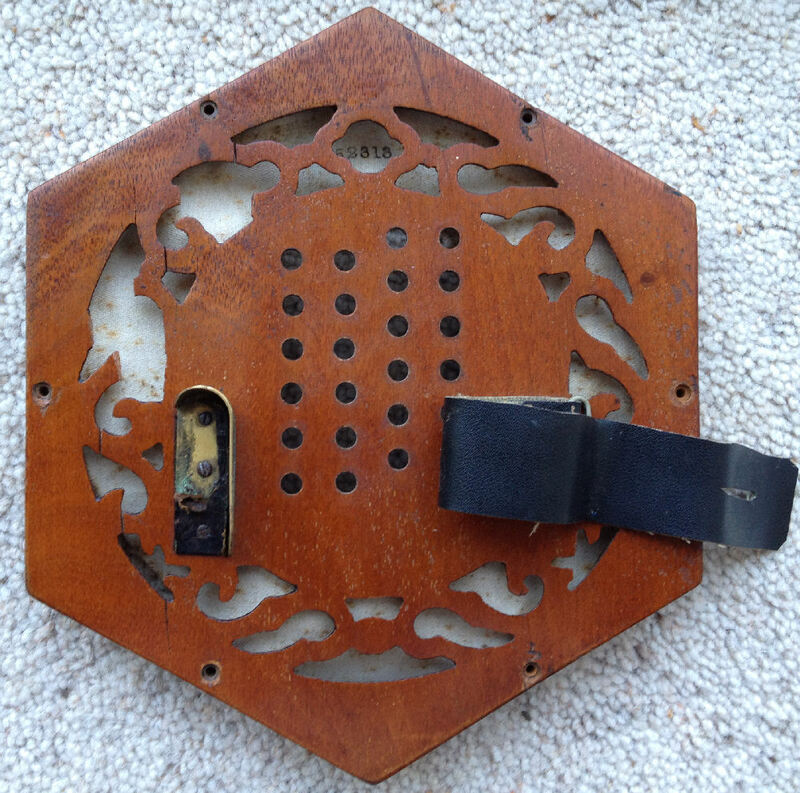 The ends are wooden fretwork, cracked in places and with small sections missing. The bellows are black, and abraded in areas, with green stars on white coloured patterned transfer on each segment. 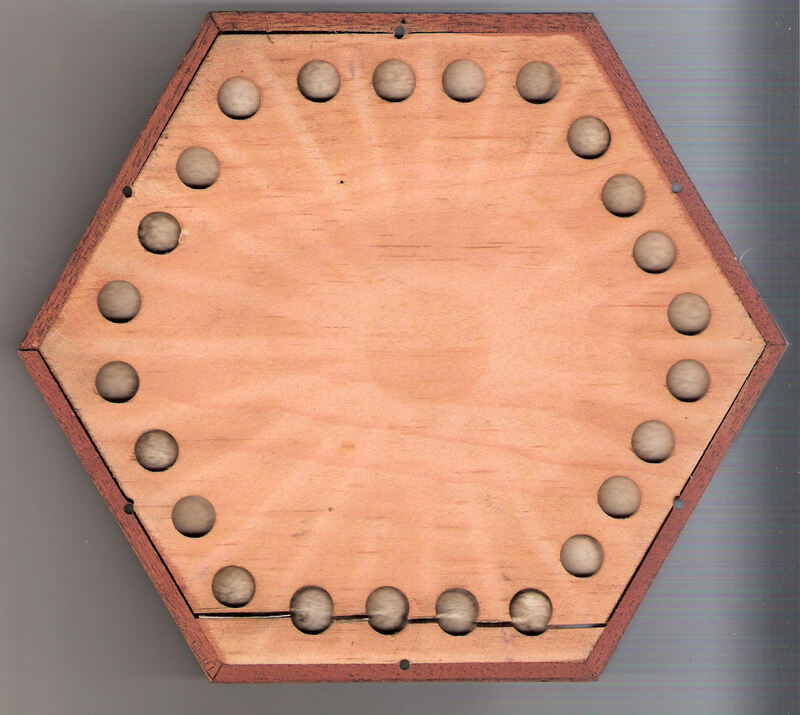 One one end, in an oval aperture in the fretwork can be read "Lachenal & Co, Patent Concertina Manufacturer, London". At the other end is a serial number,52313 (originally thought to be 58313), dating it from around 1921. The original thin white linen baffles are present. 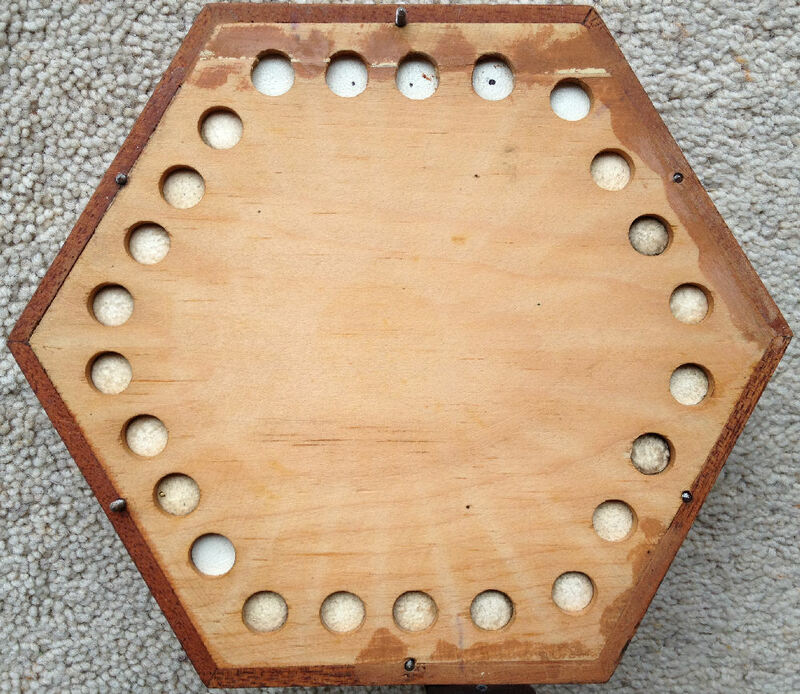 It has its original wooden box with velvet lining. Unfortunately this holds it in an 'ends-up' position, which is not good for it. 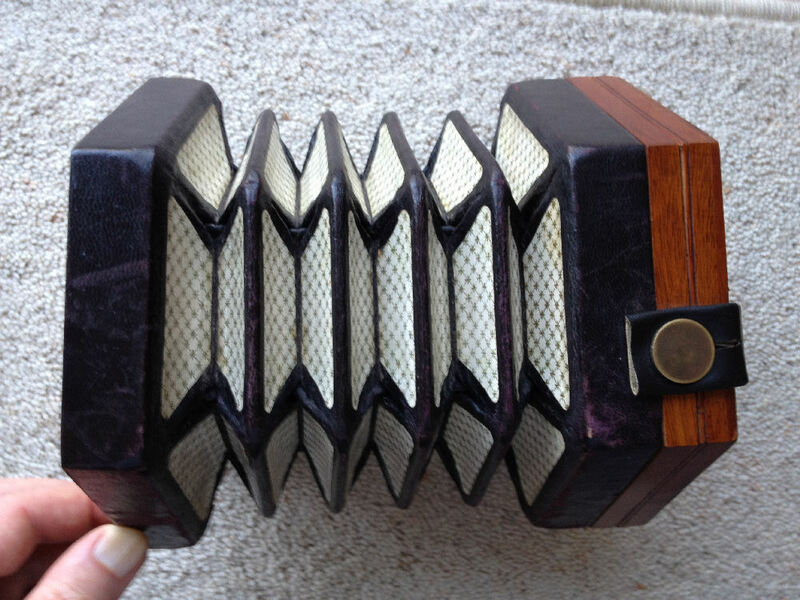 It is an English concertina, which means that it produces the same note when a key is pressed, regardless of whether the bellows are going in or out. 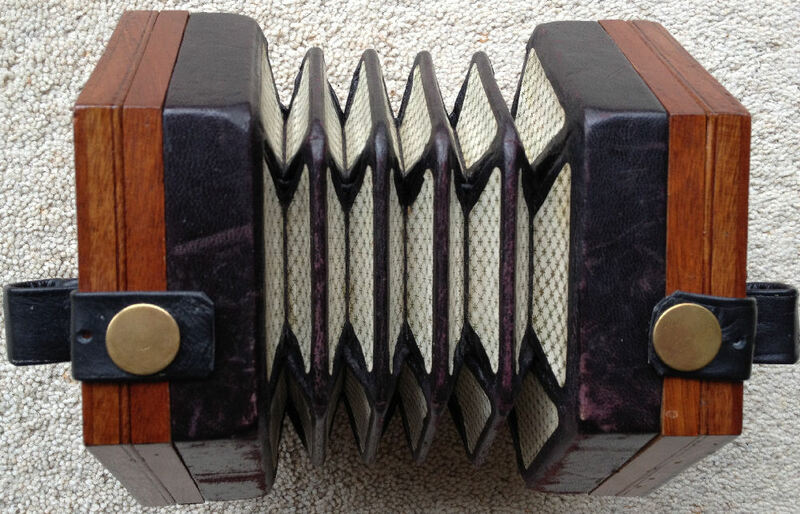 The other main type of concertina is the Anglo, which gives different notes according to bellows direction, like a mouth organ does. 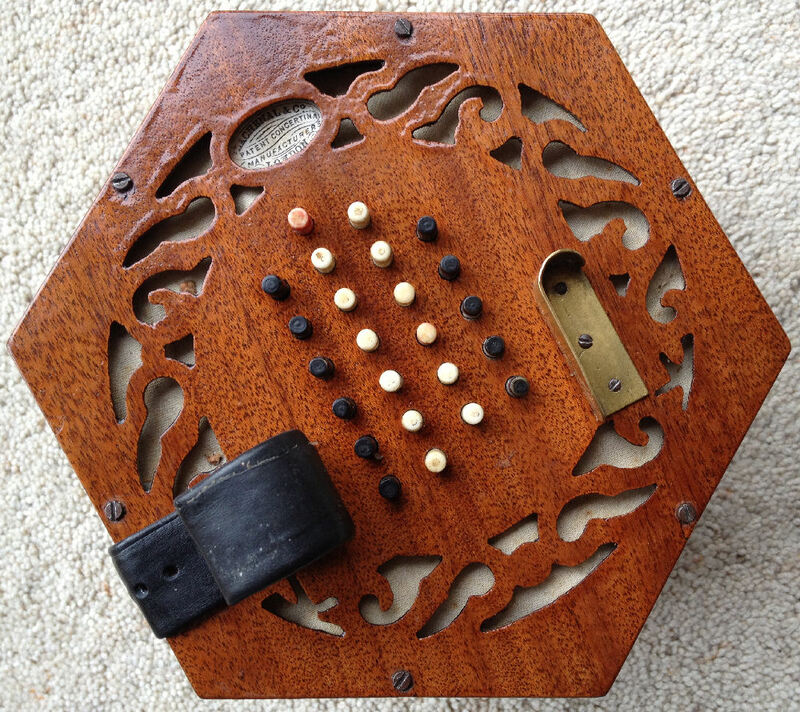 The instrument was bought through eBay from John Sheehy in London, UK for £201 + £10 p&p.It was indeed in condition "for parts or not working" as described, and not playable. The biggest problem is a very badly cracked pad board at one end (and smaller cracks at the other). The edging is detached from the pad board on three sides. You can see the state of the pad board in this picture. 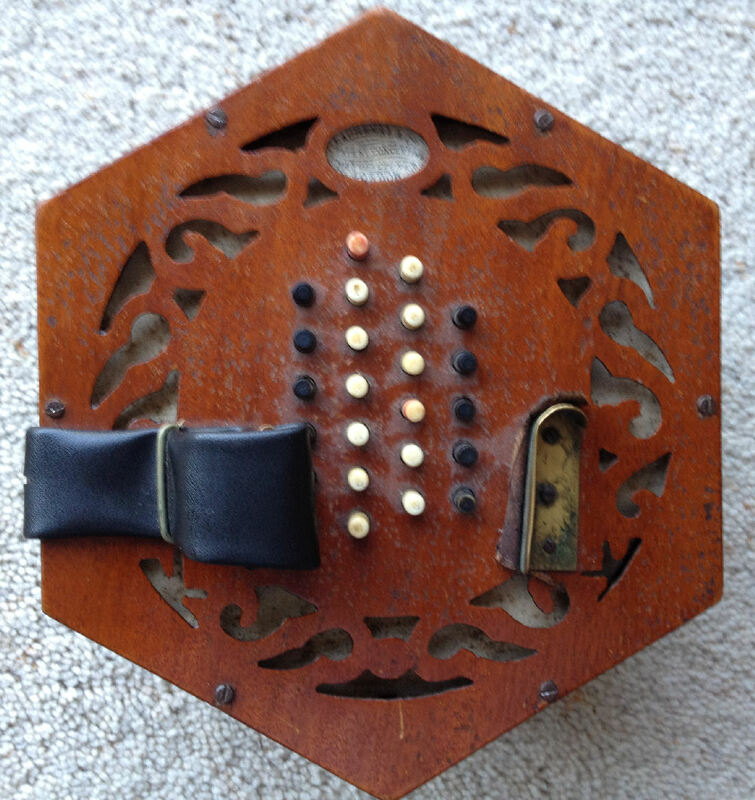 The thumbstraps are poor and homemade, and the finger rest leathers are worn out. The exterior varnish or french polish is badly blistered, and the fretwork is cracked and absent in places. The reeds are brass, with the C1 on the left side broken (has reed carrier but no tongue visible). Two others don't work well. Interestingly the low G on the right appears to be tuned to an F# on the pull and G on the push, presumably to increase the range. It is not in concert pitch, being about 50 cents sharp, so in old philharmonic pitch.. I'll update this as repairs progress. 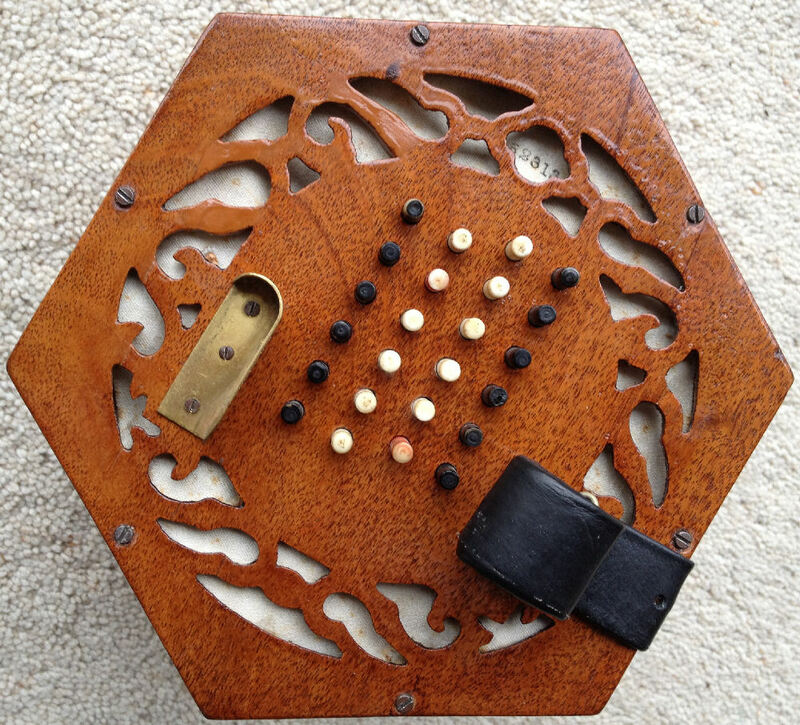 I stripped the concertina down, removed the blistered varnish/lacquer from the ends, and rebuilt the missing fretwork sections out of plastic wood. 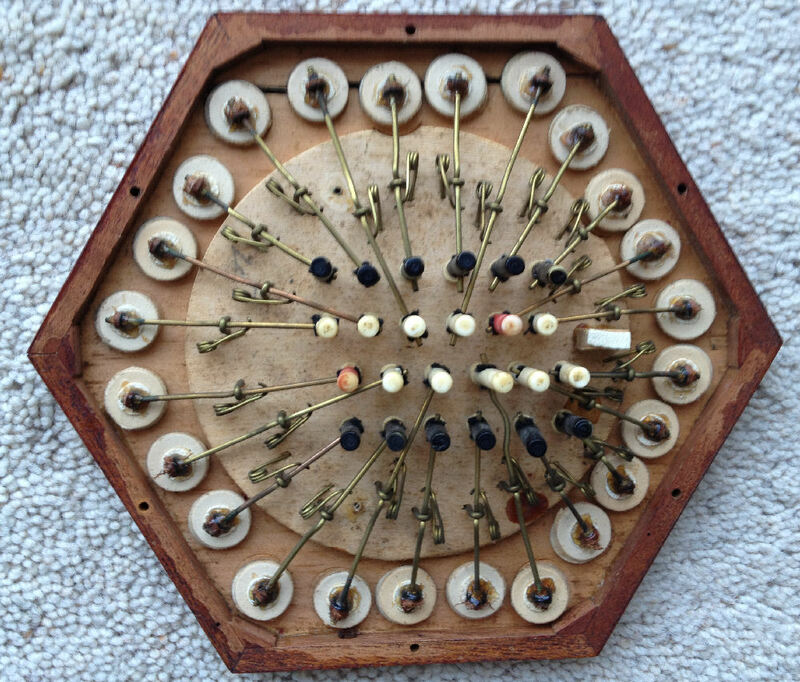 I recoated the ends with french polish and brass polished the thumbrests and strap screws. The padboard literally fell into two along the crack, so I reglued it tight, and filled the (still large) cracks from the wood shinkage initially with two-part epoxy wood filler, then with fine plastic wood, and sanded smooth. I replaced about a dozen pads. I got two new replacement reeds from Concertina Spares, along with a kit to rebuild the thumbstraps. The instrument now plays, although it is still slightly leaky. It sounds quite good, though still in old pitch.